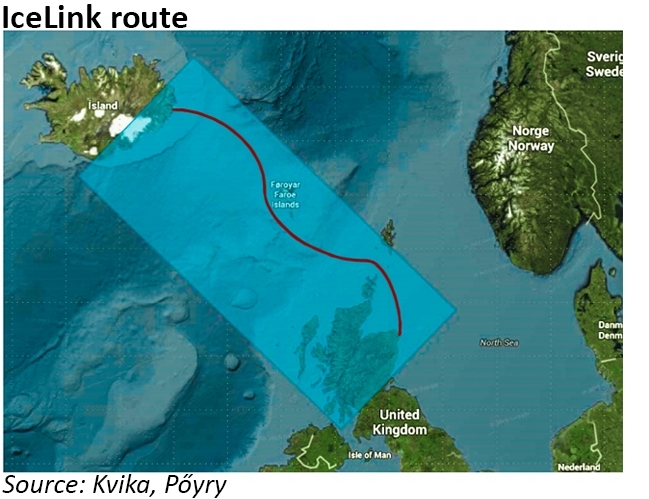 Back in April, the press was full of the news that a new Icelandic energy project could revive the prospects of IceLink, the Iceland – UK interconnector project. This week has seen progress in another energy project which may also be of international interest. Iceland is unique in its energy position meeting 85% of its needs and just about all of its electricity production through renewable sources. Sitting at the junction of the European and North American tectonic plates – the mid-Atlantic ridge runs straight through the country – and with several active volcanos, Iceland benefits from easily obtainable geothermal energy and significant amounts of hydropower. In fact, this energy abundance means Iceland is a major global player in the energy-intensive aluminium industry, currently being the 10th largest producer worldwide, which is surprising for a country of just over 330,000 people. Almost 80% of Iceland’s electricity production is used in energy-intensive industries, with households making just 5% of the total. 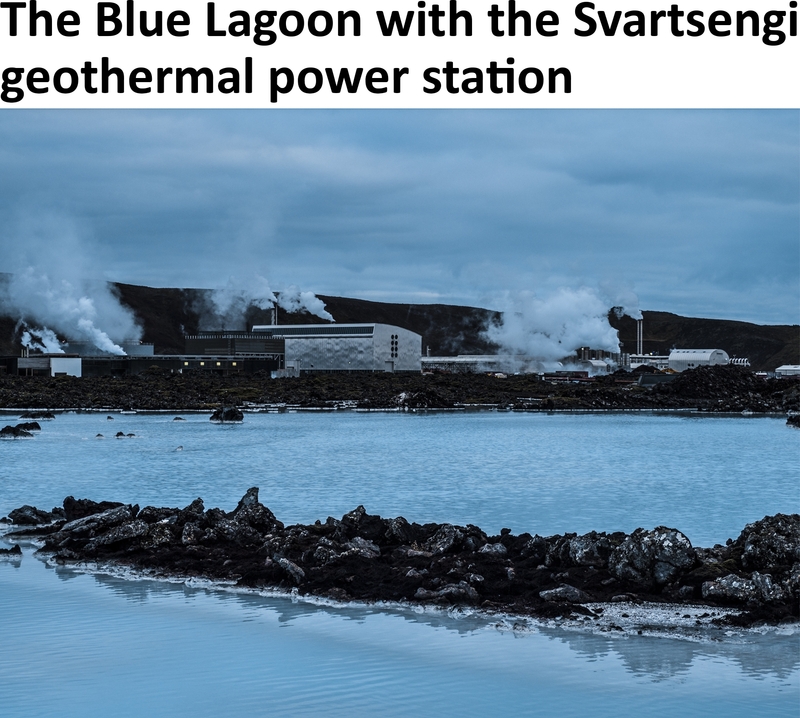 The iconic Blue Lagoon spa is a man-made feature using waste heat from the nearby Svartsengi geothermal power plant. Superheated water is vented from the ground near a lava flow and used to power the turbines. The hot water and steam then passes through a heat-exchanger to provide heat for a municipal water heating system before being fed into the lagoon for recreational use. There are three types of geothermal power plants: dry steam, flash steam, and binary cycle. Dry steam power plants use underground resources of steam which is piped directly from underground wells into the power plant. Flash steam power plants are more common – these use water from geothermal reservoirs with temperatures greater than 182°C which flows up through wells under its own pressure. As it flows upward, the pressure decreases and some of the hot water boils off into steam which is then separated from the water to power a turbine. Binary cycle power plants operate on water at lower temperatures of about 107°-182°C. These plants use the heat from the hot water to boil a working fluid – usually an organic compound with a low boiling point – which is vaporised and used to turn a turbine. The project announced in July was the US$100 million Krafla Magma Testbed project to determine whether geothermal energy can be produced from magma. If successful, the scheme has the potential to produce up to 10 times more than a conventional well, equivalent to powering 1.6 million homes. The test will involve drilling a 2.1 kilometer deep borehole, directly into a magma chamber below the Krafla volcano in northern Iceland. In theory, water could be pumped down the borehole through reinforced U-shaped pipes, with the resulting “supercritical steam” being used to power turbines. It is rare for the location of magma chambers to be known – typically the behaviour of magma can only be inferred from surface phenomena – but this chamber was discovered by chance in 2009 as part of a deep drilling project by Iceland’s energy company Landsvirkjun. The first phase of the project, which is being coordinated by Iceland’s Geothermal Research Group and the British Geological Survey, is planned to start by 2020 and will cost US$30 million. 38 other institutes and companies from 11 countries are also due to take part. The prospect of such a huge new source of electricity has boosted the prospects of the Iceland-UK interconnector, whose fortunes were uncertain following the UK’s decision to leave the EU. If built, IceLink would be the world’s longest power interconnector – the shortest distance between the countries is less than 900 km, but the route could be up to 1200 km long (see map). The link would have a capacity of 1,000 MW, and is estimated to cost €3.0-3.5 billion – almost twice the cost of the London Array offshore windfarm – although this does not include the cost of internal grid reinforcement that may be need in either country. Calculating the value of the interconnector is not straightforward since there is no spot price of electricity in Iceland (as there is no short-run marginal cost), so the valuation is based on the value added to the GB market. The Integrated Merchant case internalises the rents made by the cheapest of the new generation in Iceland, and reaches a rate of return closer to a commercial hurdle rate but still on the low side. A cap and floor mechanism would de-risk the revenues, but overall this option is less attractive financially. Clearly, since this analysis was undertaken, the UK voted to leave the EU and the costs of offshore wind have fallen significantly, undermining the business cases for the project. As I have noted previously, most climate targets over the coming decades target such low carbon emissions that some form of carbon sequestration is essential for achieving policy ambitions. However this requirement does not mean that viable technologies exist. Some progress has been made recently in Iceland, where the CarbFix2 project at the Hellisheidi Power Plant, has demonstrated a method of capturing CO2 directly from ambient air, dissolving it in water, and then pumping it 400-800 metres below ground, where the solution quickly reacts with basaltic bedrock, forming solid carbonate minerals, specifically, calcite and magnesite. Since these minerals are stable, the carbon they contain should stay locked away indefinitely, avoiding the leakage issues with storing CO2 in gaseous form. These materials have the added benefit of being suitable for use in construction. Previously, the researchers behind the project had demonstrated CO2 mineralisation from the carbon dioxide captured from Hellisheidi geothermal power plant, achieving between 95-98% mineralisation in under two years. Initially the team scrubbed the exhaust gasses from the plant to remove the hydrogen sulphide component – both CO2 and H2S are carried to the surface with the groundwater used to power geothermal power stations – but later they were able to successfully demonstrate the technique with un-scrubbed exhaust gases. The H2S reacted with iron in the basalt to make pyrites. The exhaust gases from conventional thermal power stations and other industrial processes have different chemical compositions, including for example, sulphur dioxide, so it may still be necessary to scrub the gases before being injected into the underground basalt deposits. Any CO2 injected underground will eventually turn into carbonate minerals, however this process usually takes hundreds to thousands of years. The Icelandic process is accelerated due to the use of basalt cavities. Most of the rock that forms Iceland is basalt (90%), a volcanic material that is also rich in calcium, magnesium, and iron – the other key elements for carbon mineralisation. Basalt is a common rock, found in many places round the world, providing a potential solution to the storage part of the CCS challenge, however the majority of these deposits are on the ocean floor or in difficult-to-reach locations on land. This would mean adding the cost of pipelines to the already expensive cost of the process which is around US$600 for every ton of CO2 stored. The desire to exploit Iceland’s energy abundance is only natural – it is one of the very few places in the world where a 100% renewables energy system is feasible. An interconnector with Iceland would genuinely add to the UK’s security of supply since there would be virtually zero reverse flows, unlike other transmission projects such as IFA. Further leveraging the country’s unique geology to effectively sequester carbon dioxide has understandable appeal, but while the research is certainly interesting, being technically feasible, it is clearly not economic in its current form. Indeed, removal of CO2 from the atmosphere or waste gases is not in itself an economically useful activity, being driven by the flawed assumption that high levels of CO2 in the atmosphere will inevitably lead to catastrophic climate change. The major drawback faced by Iceland in exporting its energy resources is geography – the island is simply too far from other centres of energy demand to make its energy interconnection economic against a backdrop of falling prices for other technologies. That does not mean that the research is useless – the energy from magma project might be applicable in other more accessible places such as Yellowstone if ways of locating magma chambers can be found, and the suggested energy intensity would certainly make the effort worthwhile. Sadly the same cannot be said of the carbon mineralisation scheme.